Output to File enables you to rapidly batch convert any supported image format to either TIFF or PDF format, as either single- or multi-page files. 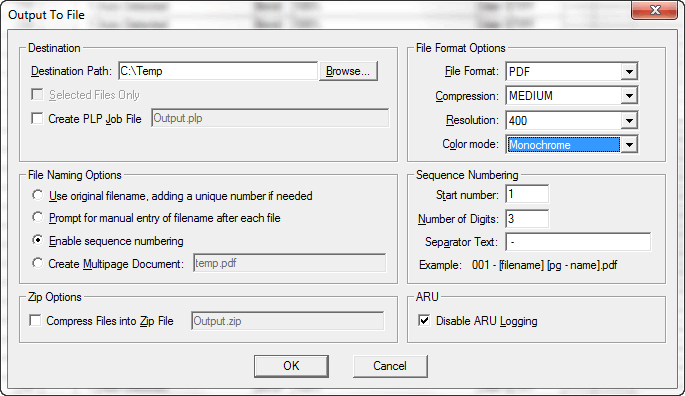 You can specify output resolution, compression method, color mode and file naming schemas. Although you may choose to convert the original files without modification, many users will adjust their images in the WYSIWYP viewer prior to conversion. This allows you to create print-ready files that with the desired scale, rotation, media size and offsets -- a capability known as Soft Copy Plotting™. With Output-to-File, you can implicity crop these images prior to conversion by placing them on a 30x42 inch sheet in the viewer. Or half-size the job on 22x15 inch media with a one inch binding margin on the left. The resulting files will be the correct size, with the desired scale, orientation and offsets.